The pyramidal Mount Alpamayo, is considered one of the most beautiful mountains in the world. The ascent towards the summit is very steep and is mostly technical climbing. It is recommended, that this mountain only be climbed by well acclimatized people who have reached the top of other peaks before attacking Alpamayo. One of the first conquerors (Günther Hauser) described his impressions of the Alpamayo with the following words:" A dream mountain appears above the valleys of the northern Cordillera Blanca, how only children who have never seen a mountain would dare to sketch it. That's the Alpayamo and not a dream, it is the reality. From one side you will see it as a symmetric pyramid, whose branches are covered with huge ice balcons. The other face of the Alpamayo, the trapeze shapes of the southwestern wall, is even more beautiful. Through the concurrence of the almost vertical appearing burning tropical sun at midday and the rising, damp air masses from the jungle, the wall has been covered by fine riffles. 1. Day: Transfer to Santa Cruz / Cashapampa / Llamacorral; camp (3800 m). 4. 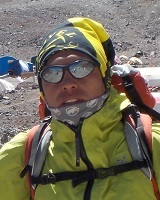 Day: Base Camp - Summit Nevado Alpamayo (5947 m). We leave Huaraz early in the morning at 7 o 'clock and carry on driving to Cashapampa where our donkey guide is waiting for us. Here, at a height of 3800 meters we will climb up to our camp Llamacorral. This we have reached after about 4 hours and here we will stay overnight. Today we will hike past wonderful mountain lakes the lagoon Jatunpampa and the Ichicocha. At a view point we will have lunch, just before carrying on towards our camp at the height of 4300 meters. Before spending our night here we will have to check through our equipment for tomorrow. Firstly over a moraine and a few rock passages until reaching the 3 hours far away glacier, and meanwhile the 5000m barrier. From here on we climb up further for 2 hours through an ice colour at a height of 5600meters. Now we climb down for half an hour towards a high camp on 5400 meters, where a refreshing night on a glacier is waiting for us. Summit Today we start early at 2 o'clock in the morning - We cross for half an hour the glacier before climbing up a 75 -80 degree steep wall (Ferrari or franch route). This complicated gap leads us directly underneath the glacier, where we will shortly enjoy the stunning view before heading for the descend, as also this shouldn't be underestimated. At midday we should arrive our high camp where we will stay another night. The afternoon can be used for recovering and relaxing. Today we will climb down the same way as yesterday towards the camp on 4300 meters where we will also stay overnight. Today the short rest ascend is waiting for us, up to Cashapampa. There a vehicle is waiting for us to take us back to Huaraz.